Dazzle stands 44.25" at the withers and has finally settled into the 325lb range, give or take. Dazzle came from a huge herd, so she's of the opinion that humans are not capable of relationships. We’re letting her take it at her speed, but don't really expect her to ever change that early-ingrained opinion. She has really impressed us with her tendency to think things through, and to advance us trust (on lead) rather than assuming the worst (as so many llamas do nowadays). In the summer of 2003, we were visiting our long-time friend, Bobra Goldsmith (Rocky Mountain Llamas). Dazzle’s stupendous gaits caught our eye. Llamas with a strong natural trot are rare, and that trait is not only ideal for harness work, but is tightly linked with a strong, even four-beated walk, which is ideal for packing and particularly powerful performance when going up inclines — so you can understand why our interest was piqued immediately. On that trip, however, we had already selected two other female llamas and couldn’t afford (or justify) a third at the time. Before we left, we let Bobra know that we really wanted Dazzle, and Bobra agreed that she would sell her to us at some time in the future, and not to anyone else. In the summer of 2007, a transportation opportunity arose and we longingly remembered how much we really, really liked Dazzle ... and abruptly decided we ought to avail ourselves of the opportunity. The future had finally arrived, and were we ever glad! Even the transporter remarked that Dazzle seemed to think this was the place she was meant to live when she stepped off the trailer. 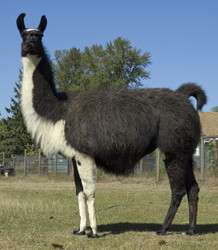 Dazzle’s strong scalenes, appropriate neck length, and functionally desirable moderate size are high-performance traits that are getting increasingly difficult to find as aesthetic-driven evaluators cause people to reject llamas with these traits before ever proving (or disproving) their theories (and the animals) on the trail. Between these and Dazzle's excellent natural trot (which she is passing on), we were very pleased to have her in our breeding herd. Dazzle is retired from breeding, and so we are retaining daughter Sage as a likely replacement. Fortunately Dazzle passed her classic coat phenotype to Sage rather than the curaca trait lurking in her genotype (which nonbreeding son Aldwyn did inherit). We don’t really know the inspiration for Dazzle’s name, although it may be intended to sound similar to her dam, Puzzle. However, her gaits sure dazzled Gwen out of a pasture full of 70+ females, and they still dazzle us here on our farm.